Even just a couple of budgies can make a pretty big mess! Here’s the schedule I follow so it never gets out of hand and I only spend a small amount of time on a daily basis. – refresh water and food bowls, if any of them are contaminated with poop change out for fresh bowls. – Hunt for floor poops and clean up as needed. – Remove perches and scrub with a tiny bit of mild dish soap and hot water using a Hard and Soft Side Vegetable Brush . This tool is perfect for getting poop out of the crevices of a cement or natural perch. Of course it should be kept well-separate from a veggie scrubber that’s used for human or budgie vegetables! 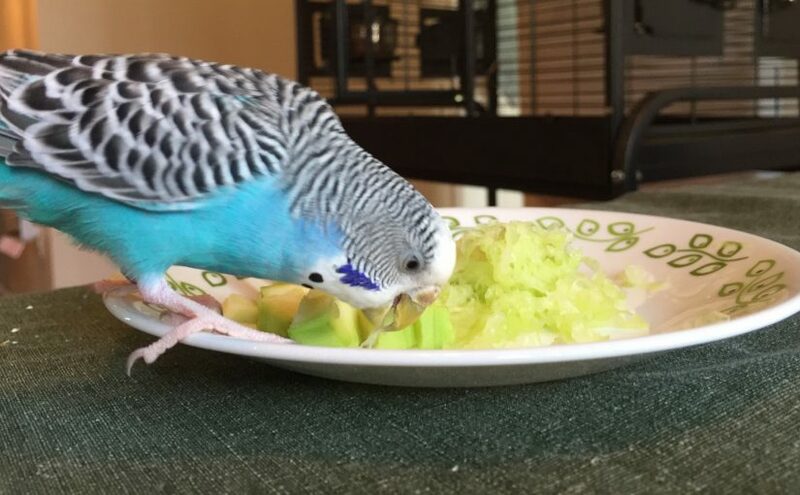 – Remove and wipe down toys, and examine for any loose threads or other ways that the parakeets could get caught or otherwise injure themselves. Rotate or retire toys as needed for mental stimulation. 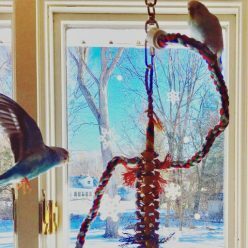 – Provide parakeets with a couple of bathing options, hanging bath, and Tupperware bath, for instance. Clean up water mess afterwards. – Remove all toys and perches from cage and thoroughly hose down cage. Use scrubber to remove poop from all cage crevices. Additionally, if you have a grate on the floor of your cage I recommend wiping that down every other day at least and taking it out for a complete cleaning weekly. I took mine out to increase the usable cage space for our parakeet and also to encourage foraging behavior, but a great side effect was much easier clean-up for me. It looks like quite a lot laid out that way, but I never feel overwhelmed by a mess or by the amount of work I have to do to keep up after the budgies. Mine are very territorial, so I usually try to wipe everything down as soon as I let them out in the afternoon. That way they are enjoying flying around and exercising while I’m hastily tidying their cage and not getting my hands bit! Let me know if I missed any critical steps!